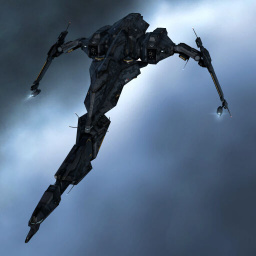 Created specifically in order to counter the ever-increasing numbers of pirate invaders in Caldari territories, the Navy Issue Caracal has performed admirably in its task. Sporting added defensive capability as well as increased fitting potential, it is seeing ever greater use in defense of the homeland. 's baby brother. It's a missile sniper boat that can kite well and is fit very similarly. It is certainly an improvement over the standard Caracal, but it has a high price tag (on par with a Drake) for less survivability, so it is not often seen in PvP. It can be a good high-sec site runner, though, being equally adept at killing frigates or NPC battlecruisers, depending on fitting. Further information about additional or recommended skills to pilot Caracal Navy Issue for a specific or it's common role(s) can be written here. No sub-article about Caracal Navy Issue roles or piloting tactics. You can write them here. You can write additional notes for Caracal Navy Issue here.